Last weekend I had a girls night out with my friends to see Mamma Mia! I decided it would be the perfect time to give them their Valentine's gifts. 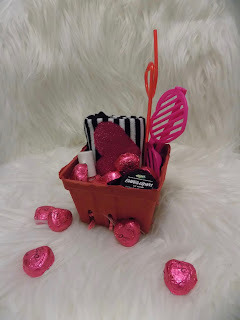 I got them a few fun red and pink items and placed them in a berry basket. After placing all the items into the berry basket and getting the look I wanted I wrapped them up in clear cellophane and tied it with pink metallic ribbon. It made it easier to deliver. It's a nice reminder that you are thinking of them. Do you get your friends something for Valentine's? What are you giving them this year?